Does your organization approach using social media in its business as something to fear or as something to evangelize? Several recent observers note that incorporating social media into business involves changing the culture underlying communication patterns and decision-making in many large organizations. Corporate culture has everything to do with adoption of social media. I believe the number one factor preventing full adoption of social media is the lack of executive trust in employees. This culture is about control and creates a workplace of silos. This type of workplace is not set up to be social and the silos are barriers to worker productivity. So, here social media sits, between fear and faith. Needless to say, the truth about social media's implications for business design lies somewhere in the middle. The fact of the matter, as Todd Defren tells us, is that we need to begin seriously discussing "how Social Media Thinking will impact the greater whole of the company." As noted in an earlier post, keeping in mind the distinctions between formal, process-oriented organization and informal, practice-based organization is crucial in thinking through the collaborative challenges posed by social software for enterprises and designing for the experiences supported. 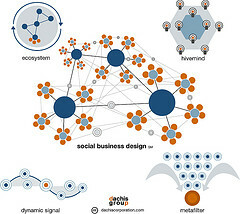 We can learn a bit about the complexity of the challenges involved by considering a recent framework offered on social business design by the Dachis Corporation team and discussing the way it relates to a recent report on an experiment in enterprise social media at the Social Computing Lab of HP Laboratories. Social business design is a mutually exclusive, collectively exhaustive way of considering how a corporation, business unit, or project can create and capture value from today's emerging technologies and evolving operating environment. I'm sure the Dachis team's take on each of these archetypes of social business design will evolve over time. David just recently expanded on the Dynamic Signal. In the rest of this post I want to take a look at the WaterCooler project report (WaterCooler: Exploring an Organization Through Enterprise Social Media) offered by Michael J. Brzozowski of the Social Computing Lab at HP Laboratories, and explore its relevance to a couple of the social business design archetypes detailed by the Dachis team. My purpose is not to argue for or against the archetypes, but to stimulate more specific discussion around the Dachis framework. One of the guiding goals of WaterCooler was to design for attention, so that users of social media within HP could more readily develop awareness of others whose expertise and interests coincided with their own (think Dynamic Signal). In other words, rather than provide an enterprise tool for finding knowledge, the goal was to make it easier to find people with some affinity to the searcher's goals and interests. Thomas Vander Wal notes that the recent Enterprise 2.0 conference failed to offer sessions on tagging and how organizations are using tags in their social software implementations. Tagging people in WaterCooler allows users to support distributed teams that span business units. Tags also provide the basis for the public profiles of WaterCooler users, even allowing anyone to apply a tag to anyone else. Given the public nature of personal profiles, WaterCooler also permits each user to retain control by removing tags considered inappropriate or inaccurate by that person. In that way, it embeds a concern for sociality and the comfort level among users that Vander Wal often speaks about. WaterCooler restricts tags to a set of namespaces -- hobby, interest, product, people, skill, or team. Brzozowski notes that some people were not satisfied with the restrictions on tagging, wanting increased freedom to tag, whereas others preferred increased rigidity. Of particular interest is his synopsis of the overall use of people tagging. We were also surprised to find some people tagging themselves with people’s names. 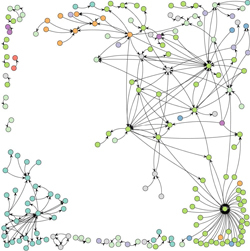 These incidences are isolated and these tags are not reused on other people, which may suggest some people want to use WaterCooler as a social network (tagging themselves with the names of their friends). 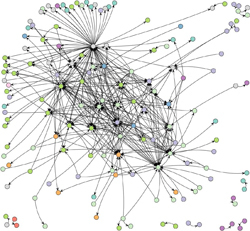 Others have done the inverse, simulating Twitter’s follower relationship by tagging people, e.g., followed by tim , and using the group of tagged people as a filter. The major finding is that in the blog commenting network 30% of comments are directed to authors outside the commenter's business group. In other words, the Hub and Spoke model appears only slightly altered by blog usage alone. In the WaterCooler readership network, 69% of readers are directing their attention outside their own business group. It is unclear from the research report why simple readership, or views rather than comments, was not used in the blog counts. However, the overall point seems to remain salient.